September 2014 - A Life From Scratch. So, a funny thing happened the other week. 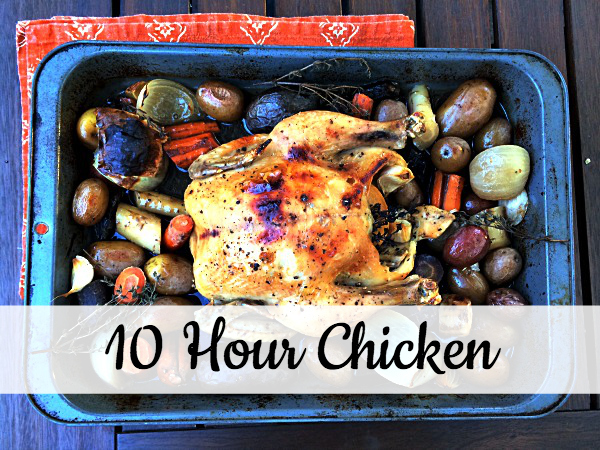 In attempt to research some great recipes for those who work out of the home, I stumbled upon Gwyneth Paltrow’s 10 hour chicken (thanks Molly!). It sounded incredible. Minimal ingredients and fresh flavors slowly roasting away in the oven all day while you’re busy at the office. Couldn’t be easier. Um… all the time. Is that weird? Quickly I found out that yes, it is. In an abundance of comments only one other thought like me and Gwen. We all know she isn’t sitting at home for 10 hours straight. So, I’m going have to rethink my approach here in regards to this recipe. It doesn’t change how delicious it is, that’s for sure. Yet it does change the entire thought process behind it. If taking the risk with the oven isn’t your thing, then view this as the perfect lazy at home all day in sweats type of recipe. Either way, you can’t go wrong. M pretty much wanted to marry me all over again when we had it. Nailed it. 1 whole chicken, roughly 5 lbs, washed and dried. 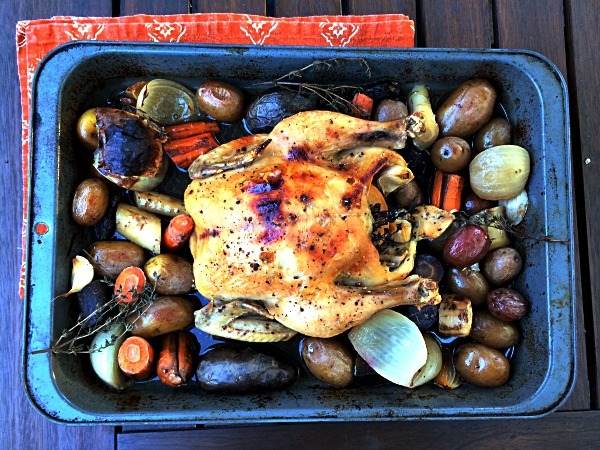 Grab a large roasting tray and throw in your potatoes, carrots, and onions. Place the chicken on top, breast side down. Salt & pepper the entire tray generously. Squeeze the lemon all over and then stuff them in the cavity along with the garlic cloves and thyme. Cover the try tightly with foil. Into the oven it goes for 9 & 1/2 hours. Remove foil. At this point Gwen says to flip the chicken and then roast for another 20-25 minutes at 425 degrees. The roasting at a higher temp part is definitely needed but it's not necessary to flip the chicken. I've made it twice, once flipped (the chicken came totally apart) and once not. Both were delicious, one way was just prettier. Oh and if you want to go a bit above and beyond, a homemade gravy from the stock the recipe yields can be found here. It was heavenly. Hi friends. I’m taking a little break from C’s picks this week since we are on vacay on the west coast. If you’d like, be sure to follow along our trip on Facebook and Instagram. 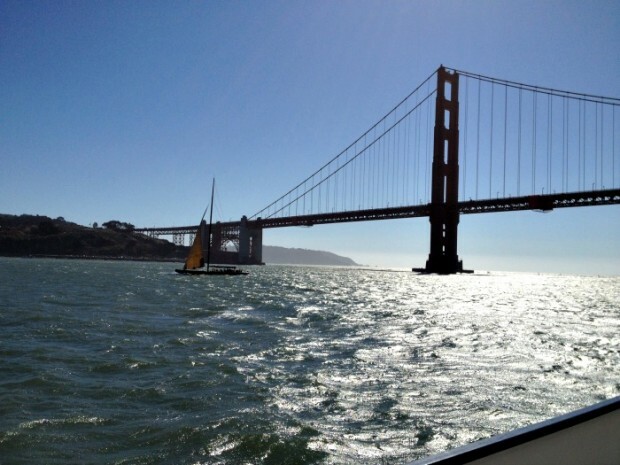 No doubt I will be inspired by the stunning state of California. If you’re a mom who normally travels with children, you’ll understand how excited I am to just be able to sit and wear these to ORD. Distressed AG jeans and an easy tee – bam, airport uniform is done. Vacationing with kids is sort of an oxymoron but there are definitely great moments. My favorite place in the whole wide world. Our Sonoma Rules from last year – wonder if we’ll have any to add this year? Hmmm. No matter where I go, I can’t leave home without this. Luckily it comes in a neat little 1.7 ounce bottle. A charming trip to Charleston. My boys’ initials will be close to my heart the entire time I’m gone. Quite possibly, my favorite post on ALFS. Going from 1 to 2 was huge, in so many ways. And last but not least…an entire archive of C’s picks for you to go through to help meal plan your week. You’re taking those 20 minutes, right? Good. Meet our great friend (and cousin! ), Becca! As a part of our Motherhood series here on ALFS, she is going to walk us through what it was like having her dashing son, Reid, through a surrogate. 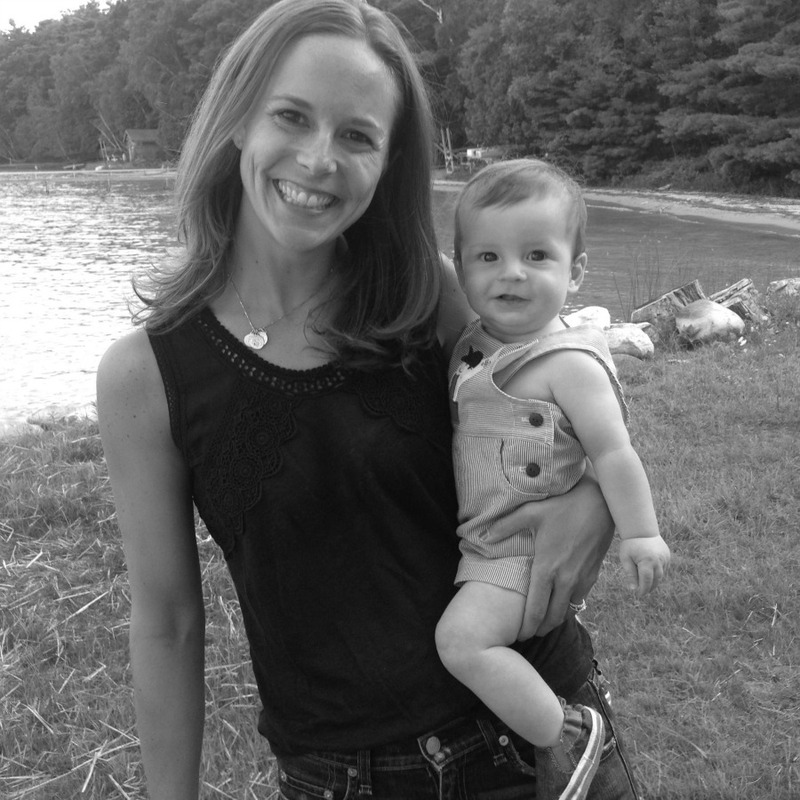 There are many love stories that lead to becoming a mom, and I am so thankful to share hers. 1. To begin, can you describe a bit about your journey that lead to surrogacy? My husband Steve and I knew we wanted to start a family and were excited for it to happen. We tried to be relaxed, have fun, and hoped for our “movie moment” of me puking in public as a sign I was expecting. But it didn’t happen. After a couple years of trying the “old fashioned way” with no luck, we were advised to seek the help of fertility doctors. 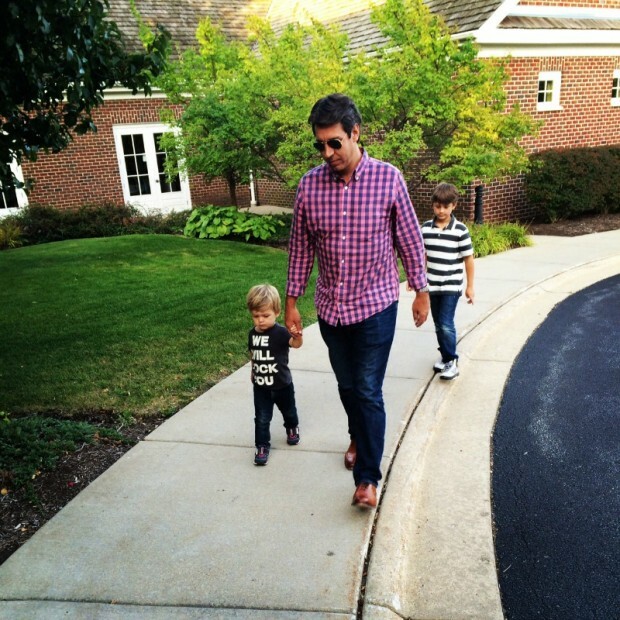 We were diagnosed with male factor infertility and the doctors were confident fertility treatments would help. However, after a variety of treatments over the course of 3 years, it became clear that my body was not able to carry a pregnancy to term. While we had healthy embryos fertilized through the IVF process (my eggs and my husband’s carefully selected sperm) and I was able to became pregnant via embryo transfer, I suffered from recurrent pregnancy loss. The sadness with each loss was coupled with incredible frustration; the road to become pregnant was so long and once pregnant my body was unable to sustain the pregnancy. Experiencing such loss was devastating and unbearable. Somehow, with the help of each other, family, and close friends, we continued on, trying to remain hopeful and keeping the faith. We knew our little angels were watching over us, helping us to keep going even though it seemed emotionally and physically impossible. While preparing for our 7th embryo transfer, our doctor suggested we consider using a surrogate should we experience another loss. More precisely, he suggested we use a Gestational Carrier: a surrogate mother whom we would transfer our genetic embryo into and she would hopefully carry our baby to term, something I was unable to do. After that last transfer, and our fifth miscarriage, Steve and I decided it was time to move forward. Although there was no clear explanation, my body was unable to sustain a healthy pregnancy and our physician felt surrogacy was the next step and would give us the best chance of having a baby. 2. 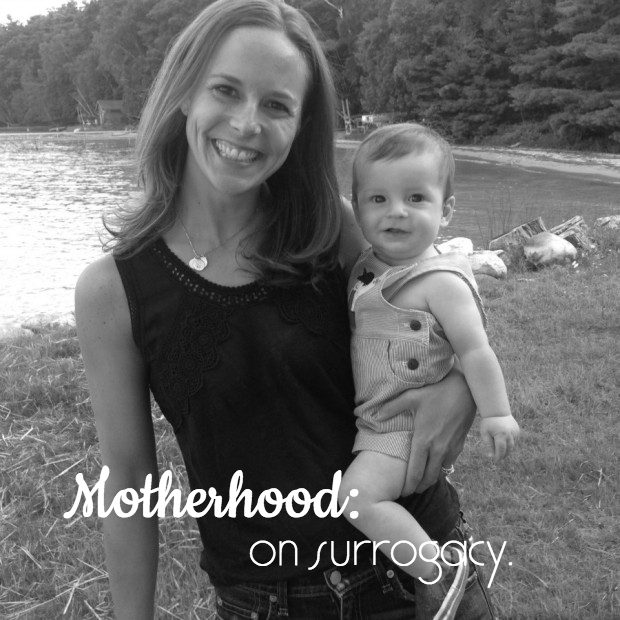 What was it like choosing a surrogate? Were you presented with multiple options? The process of finding a surrogate was very overwhelming, emotional, and exciting all at once. Based on our physician’s recommendation, we met with several surrogacy agencies in Chicagoland area. We ultimately chose CEO (the Center for Egg Options) to assist us as Intended Parents get matched with a Gestational Carrier (GC). The agency role is also to assist during the entire pregnancy and to act as a liaison between intended parents and the surrogate. We completed extensive paperwork upon signing up and they presented us with two GC’s they felt would be a good fit for us. We read over both and decided we wanted to meet V. The agency spoke with her and she was interested in meeting us as well. It was like a really odd first date with Nancy, the director of CEO, being the match maker. I was beyond nervous when we were driving to the meeting. And emotional and scared, excited and hopeful all at once. As soon V, her husband, and youngest daughter walked in, my fears were eliminated. We stood up to say hello and she immediately hugged me and said, “I know I can help you have your family.” I teared up and felt we were on the right path. We continued to talk and get to know each other with Nancy being the moderator. We discussed our life, our fertility journey, our hopes. We got to know V’s family, her experiences being pregnant with her daughters and as a surrogate once prior. We discussed why she decided to become a surrogate. We connected on important issues, and Steve and I knew that our baby would be in a wonderful, loving home during the pregnancy. At the end of the meeting we all knew that this was going to be a good fit, that together we would grow our family. 3. What was it like sharing the news you were expecting via a surrogate? How did those close to you react? Incredible and totally unbelievable all at once. Some days I still don’t believe it. It seems like a wonderful dream. Our family and closest friends knew we were moving forward with surrogacy, but no one knew besides our parents where we were in the process. After each doctor’s appointment we knew the baby was getting stronger and growing, but we still didn’t feel comfortable telling anyone. One more week. One more appointment. Just wait. It was like we were worried once everyone knew something would go wrong with the pregnancy. After the 20 week ultrasound we finally felt comfortable telling everyone. There was an outpouring of joy and excitement for us and numerous, numerous questions, of course, which we were all too happy to answer. 4. What was your relationship like with V during the pregnancy? Throughout the beginning of the process and the pregnancy our relationship evolved. We became close while balancing our own lives. We were fortunate enough to live in the same area so we were able to attend every doctor’s appointment with her. Even the short ones. Steve and I wanted to be part of it all. We both anxiously awaited each month’s appointment so we could see her, hear the baby’s heart beat, and the doctor’s update. Yes, your baby is really in there! We needed a lot of reassurance and V and her OB understood that. Each doctor’s appointment often began with a hug for me from the doctor and reminder for Steve to breathe and relax. Between appointments we would chat and check in regularly. V would also text or call right away with important developments like when he got the hiccups or if she was over feeling nauseous. And the first time he kicked. Amazing. While I couldn’t feel it, I knew he was in there, kicking away, growing strong. She filled me in on everything, answered all of my questions (which were a lot), and I am still so appreciative. While we were expecting a baby and I was over the moon, I was still dealing with the fact that I was not the one carrying the baby. She let me experience it through her. She was open with us and and for that I am forever grateful. 5. How did you prepare for motherhood during those 9 months? I waited. Very. Patiently. It seemed so unbelievable we were having a baby, and we wanted to hurry up and meet him already! I also had extra time on my hands now that I was no longer going to the doctor everyday for fertility treatments. All we had to do was wait. I had a strict ‘No Google’ rule when it came to pregnancy facts, which merged into a strict “No Pregnancy Books” rule as well. Looking things up and reading about everything made both of us fear the worst and spin into unneeded stress and anxiety. So we stuck to facts from our OB and updates from V. And we waited. And prayed for V and our baby. We did a lot to distract ourselves to make the time go faster. We went to movies. We went to brunch. Dinner. Explored the city. Went on getaways. We watched a lot of Netflix. We tried to appreciate walking out our door without a stroller or a car seat. But we just ended up talking about how we couldn’t wait to walk out our door, juggling a baby, carseat, and a diaper bag. At 20 weeks we found out we were having a healthy baby boy. Wow. Knowing the gender helped us to fantasize about our little boy and to connect and bond with him from afar. We finally let ourselves externally prepare with decorating the nursery, washing clothes, folding blankets, and getting in boy mode. We started to purchase all those items we had dreamed about for so long: car seat, crib, glider, stroller… this nesting also helped the time move forward. We were having a baby! This was also when we told friends and family we were expecting. And the baby shower planning began, something I reluctantly agreed to at first. Wasn’t it strange to go to a shower and the expectant mom doesn’t have a baby bump? Everyone loved to oohh and ahh and touch the belly and I had no physical evidence of our baby who was coming soon. My close family and friends disagreed, they wanted to celebrate the upcoming arrival of our baby and include V, which was so amazing. She happily agreed and it was beyond special to have them there to experience that moment of preparation and celebration with us. 6. What was it like when Reid was born? I’m assuming you, as the mother, were apart of it all? Incredible. Amazing. Surreal. Steve and I were with V and her husband during the entire birth process. We had hospital rooms right next to each other, and we were in her room the entire labor. I think about the day he was born and still don’t really believe it happened. He was born after 14 hours with the cord wrapped around his neck. Very dramatic entrance. And once he was free and Steve cut the cord, the doctor immediately put him in my arms, and we all sobbed. Steve was next to hold him; normally nervous around babies, he held onto Reid like he had known him forever and in many ways we had. The nurses had to pry him away to clean him off, weigh and measure him. They also reminded me I was allowed to take photos. What? Really? Oh yes, this is my baby! And we haven’t stopped documenting each incredible moment since. After we held him, V had the chance to hold the little bundle she had been carrying all these months. Over the next two days we spent most of the time with Reid in V’s room. Her daughter met him, brushed his hair, everyone snuggled him, and we all soaked in the joy that came with Reid in our lives. That first night, after our parents left and we enjoyed pizza with V and L in her hospital room, we returned to our room. Steve went right to sleep, exhausted from the whole experience. I stayed up holding Reid, rocking him and saying “I’m your mommy, I’m your mommy, I love you so much” over and over. The nurse came in to check on us at some point in the middle of the night. She encouraged me to put him in the bassinet and to get some sleep. “But we only just met” I replied. And she understood that I needed to just hold him all night long. 7. Will you ever tell Reid about the surrogate? Yes, Reid will always know V, and her family will always be a special part of ours. Each night before bed, we say our prayers with Reid and thank God for her family and all they have done for us. At some point when we feel he is ready, we will tell him the wonderful story of his birth and how V took care of him because I was unable to. We will tell him of the first time we saw him, how we nicknamed him “Superman” before we knew he was a boy, how we cried when we heard his heart beat, and how he always had the hiccups when he was in her tummy. He will know we have loved him from the very, very beginning. We haven’t determined when that will be, but we will be open with Reid and express how fortunate we are and how amazing it is to have V in our lives. 8. Anything you would tell someone who is thinking about becoming a surrogate? How about to someone who is thinking of using one? To anyone considering becoming a surrogate, thank you. Thank you for even thinking about helping someone have the family they always dreamed of. It is also a very serious, important decision, so talk to your doctor and meet with an agency; they will walk you through the entire process to determine if it the right path for you and your family. To anyone thinking about using a surrogate, stay hopeful and strong during your journey. I know that is easier said than done, but it is so vital to keep hope alive. It will keep you going through all the appointments, tests, paperwork, and waiting. So much waiting. Talk with your doctors, meet with surrogacy agencies, and ask a lot of questions. There are so many wonderful options out there and knowing what they are is an important piece of the puzzle. If surrogacy is the right option for you and your family, it is an incredible, amazing experience that will ultimately bring you the greatest love of your life. Steve and I look back now and can see that each step on our journey to parenthood, no matter how painful, led us right here. Led us to Reid. To our smiling, laughing, growing baby boy. In middle of the night I still check on him. He has slept all night for awhile now, but nonetheless I check. Is he still here? Was this all just a dream? No, he’s here, sleeping away. Incredible. And I go back into my room and count down the minutes until I get to see his giggling face in the morning. We are so so blessed. Anyone else in tears? Thank you, Becca, for sharing your wonderful story! We couldn’t be happier for your family. Reid is an absolutely perfect addition. I grew up with apple orchards all around me and, as a lover of Fall early on, I was in my element. Crisp red apples weighing down tiny trees, bright orange pumpkins to climb all over, bumpy hay rides, sky blue fresh air, and of course – baked goods. Baked goods galore. Oh yes, Fall and I got along well. Ever since I can remember, my mom and her good friend and neighbor, Nan, would host an apple picking day. It involved picking heaping bushels of apples with an assortment of children (sometimes their own, sometimes not) and then baking for the remainder of the day with said apples. Pies, tarts, crisps, dumplings, cakes, and a total kid fav that actually is apple-less – cinnamon roll ups. Yes these two rockstar moms would somehow get all of this completed while managing the sometimes rowdy children just in time for the guys to come home for dinner (always take out pizza). Then? Well, we’d feast. Now at 33, I’m happy – no, thrilled – to say that for a good part of those years I’ve still been able to make this tradition. Of course it looks different now. With kids scattered all over, it’s not always the same core group. Sometimes people sit a year or two out. And that’s OK. The apple orchard we frequented was 5 minutes away, became 15 minutes away, and now is pushing an hour. No one seems to mind though as we all pile into whoever’s car is biggest and drive down the lonely country roads. But it’s also more than that. It’s about the memories that were made and the memories that are to come. Seeing L in charge of the same apple peeling task I did 20 years ago and loving it just as much is, well, nostalgic. Out in the orchards, we always seem to swap the same exact stories from apple picking days past. And we laugh. It doesn’t matter who came or who didn’t or if it’s a good year or a bad year, as we’ve all had both. Our little apple picking group that started as two close neighbors and a bunch of carefree kids has had babies, raised babies, played with grandkids, danced at weddings, cheered at college graduations, started new jobs, switched said jobs, had kids move, and had kids come back. And you know what? The coming back is always the best part. Even if it’s a different orchard. 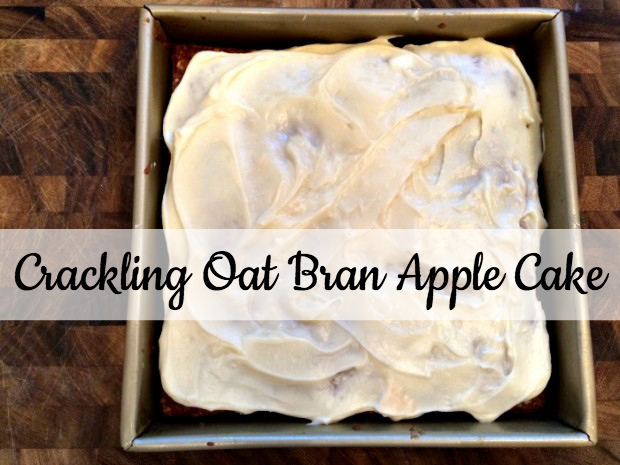 This Crackling Oat Bran Apple Cake recipe comes from Nan and for some reason was overlooked by me over the years. I tended to lean toward the brown bag apple pie instead, but this one has been a long standing favorite of many. In fact, I think it might just be the best one. Cream together butter and sugar. Add in eggs and mix. Add in cereal and remainder ingredients - mix well. Pour into a greased 9X9 cake pan. Bake at 350 degrees for 30 minutes…we think. It's never been written down. Check after 30 but lean more towards 45 minutes. Cream together cream cheese, butter, and vanilla. Add in powder sugar. If too thick, add in a splash of milk. Frost cake once it's cooled. How is your weekend going? I hope well! Ours has been pretty chill. Sunday we’ll be eating up deep bowls of homemade black bean soup at my mom’s. Oh, and stuffing ourselves with oodles of homemade baked apple goods. Best day of Fall, ever. I’m thinking a big batch of homemade (healthy!) bolognese sauce is a good way to kick off the week. I’ll get it done during nap time so come dinnertime, all I will have to do is toss with fresh pasta. A great part of this recipe is that it makes a ton, so share with a friend or use for another night of the week. Tuesday let’s try out a new recipe from my new book, Dinner: The Playbook: A 30-Day Plan for Mastering the Art of the Family Meal . (Thank you Becky!) Sticky pomegranate chicken pieces, brown rice, and sugar snap peas. I will keep you posted! Slow cooker cuban braised beef and peppers sounds fantastic to be simmering away all day Wednesday. After football all that will need to be done is make the brown rice which, thanks to Trader Joe’s, only takes 3 minutes. Delicious. Thursday mom is out! Boys, have fun. And gosh – that brings us to Friday and to my last night home before M and I are off to California. I’m going to miss my boys so much. Dinner in together, his & hers styled pizza, sounds absolutely perfect. That’s our line up – tell me, what are you making? P.S. I’ve gotten so many inquires about B’s shirt! It’s from Crewcuts but unfortunately is no longer available.